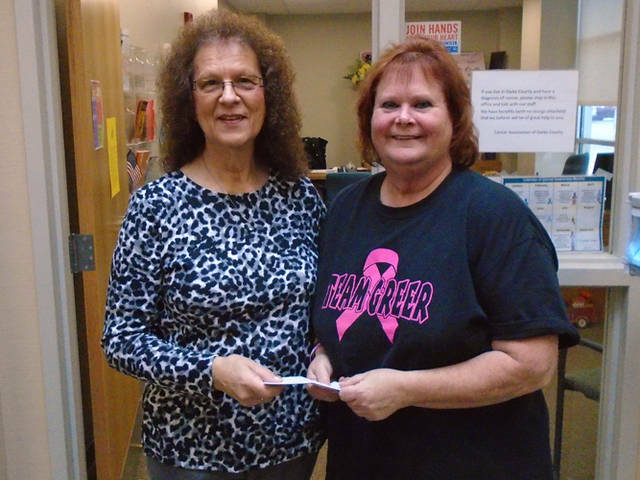 Cancer Association of Darke County Treasurer Trudy Eastland (left) accepts a donation from Sandy Greer of Team Greer. UNION CITY – Team Greer held an auction on Oct. 20 at the EUM Church in Union City. The fundraiser raised $653 and donated it to the Cancer Association of Darke County. Team Greer wants to help local cancer patients in their difficult battle with cancer. The team hopes to make this an annual event to donate to the organization. Cancer Association of Darke County appreciates all donations and uses the money for reimbursement for mileage, medication, medical supplies and nutritional supplements to Darke County cancer patients, officials said. The association is funded by donations, memorials, special fundraisers, grants, United Way and corporate sponsors. The Corporate Sponsors for 2018 are Brothers Publishing, Diane Evans Insurance, First Assembly of God, Greenville Memorial Auxiliary 7262, Greenville National Bank, Hansbarger Home Solutions, Johnston Chiropractic Clinic, Law Office of Rudnick and Hosek, Mercer Savings Bank, Second National Bank, STAR 88.3, Versailles Savings and Loan and Zechar Bailey Funeral Home. Anyone who would like further information should call the office and speak with Christine at 548-9960. She is also available to come and speak to groups at no charge regarding the organization and benefits, etc.